Valentine Mountain has one of the best views of the Powell River area. Here you can enjoy a panoramic view including Townsite, The Mill, The Hulks, lakes, ocean, mountains, and beyond. 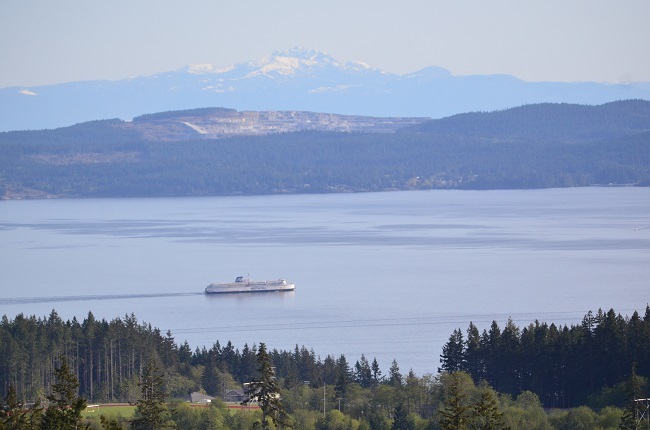 It truly is a beautiful sight and just one of the many great hikes that Powell River has to offer. It is a very short uphill trail, less than 1km in length, and complete with about 100 wooden and rocky steps. At the top, enjoy a picnic and explore some of the smaller trails around the summit. On the east side you can see Cranberry and Mowat Bay. If you head to the North side you will get a spectacular view of the Powell Lake Marina and Scout Mountain. This hike is great for couples and families as it is short and fairly simple, while also offering you a great taste of the Sunshine Coast. Follow Joyce Avenue North until it ends at Manson Avenue. Then take a left on Manson Avenue and follow it for about 5 minutes until it ends on Cranberry Street. Take a left onto Cranberry Street and drive approximately 500 meters until you reach Crown Avenue. At the end of the road you can park and then begin your climb up the mountain to see 360 degrees of our city and surroundings.